Not to state the obvious, but boats in charter, especially popular models like the Helia, get used a lot by many different people. As a result, LIB has seen a good amount of traffic and has been handled by a wide variety of captains. Frank and I did many things to “de-charterize” LIB in September, October and November last year, and we have been very happy with our efforts. One thing we really debated about was new sails. Charter boat sails get raised and lowered very often, especially in the BVIs where a sail might be just an hour or two. We believe this high usage and variety of captains resulted in some extra stretch in LIB’s sails. While we knew we could keep our original sails, we began researching sail makers early in 2015 when we went to the Chicago Boat Show. Rolling up the old sails. All of the major sailmakers were represented at the show, so it was a convenient way to compare the different materials and begin to get comfortable with what we wanted if we chose to buy new sails. Since we were still more than six months away from moving on LIB, we weren’t there to make decisions, which was good because we walked away from the show dissatisfied with the information we had received. What we definitely learned was that sails for warm weather climates and high UV exposure needed different consideration than those used in more northern areas. We decided we wanted to find a representative who knew the needs of warm weather sailing and whom we felt listened to our specific wants and needs. Frank did a lot of reading and we spoke to a variety of sailmakers in the Caribbean. It wasn’t until we met Andrew Dove with North Sails, Antigua that we found the combination of sailmaker, sail material, service and personality that met our requirements. New sails in the bag. We were looking for sails that would perform a bit better than our original ones. Since sails tend to stretch and loose shape over time, we specifically wanted to find sails with a flat degradation curve i.e., sails loose shape and performance over time, we wanted to find sails that maintained performance for several years not sails that lost performance quickly initially, then maintained that reduced level of performance over the life of the sails. We also wanted the loft representative to come on board LIB, make specific measurements for our boat, explain his sail plan model and sail with us after delivery to teach us the best way to use the new sails. Once we met with Andrew and began discussing what we wanted and hoped for in new sails, Frank and I were immediately comfortable with the idea of having North Sails craft new cloth for LIB. December 2015 we placed an order with North Sails and this week we have taken delivery of our new 3Di sails. Andrew takes a close look at the main sail. The sails look very different from our original sails both in shape, stretch and color. If yesterday’s test sail is an accurate indication, we believe we will be able to head about 7 degrees higher into the wind. During the test, the wind varied between 6 and 13 knots. It was mostly light and swirly but we managed to sail at almost half of wind speed on a 42 degree port tack. With our previous sails, in similar conditions, we would probably have sailed at 48 or 50 degrees. We are very pleased with the improved performance. Using the feedback from our sail yesterday, we are making some minor adjustments so we can tighten the main halyard a bit more. I think we will be very happy with our new sails. Taking a hint from Starry Horizons, Frank moved the lazy lines for our sail pack to the outside of our spreaders. The result is that the bag opening is wider when unzipped and our main sail can move up and down more easily without getting involved in the lazy lines. We still have our original sail stack-pack as new ones are quite pricey and this one does an adequate job. I like the gray sail color with the cushions material I so painstakingly chose, so I would like to replace the tan stack-pack for a silver/gray one. This would make the color of the sails, stack-pack and cushions work together well. I might have to wait a bit for that change though. Gray main and red spinnaker – not bad. Two additional pretties for LIB were refinishing the teak on the cockpit floor and refinishing the cockpit table. I like the rich tones of this sealer. Our teak floor had worn down a bit and the grout was slightly more raised than the teak giving parts of it an uneven feel. We had the teak professionally sanded and the caulk replaced in a few spots. Then Frank and I applied a tinted sealer. The darker color makes the floor a bit hot on the tootsies at times, but we really like the look. The table looks and feels much nicer. We use our cockpit table for most meals and plenty of projects, so it gets a ton of use. TMM did a good job of keeping the table charter ready by using cetol since it is such a durable finish. We found the cetol to be a bit soft and sticky, so we wanted to have the table stripped and varnished. Tejean, a wood worker in Rodney Bay, St. Lucia, spent days sanding and varnishing the table. His effort made a huge difference and we love the way the table looks now. Hopefully these few projects will be the end of any major ones for a while. It’s time to get some time in with our new sails before we head back to the States in a few weeks. Best Week Ever On LIB? Probably. For the first time since we moved on board in September, we had our whole family aboard LIB! We had such a great time just hanging out and being together that it was really hard to see the kids leave again. We are truly fortunate that all of us get along so well and enjoy being together. We spent the week in Antigua and managed to hit a few places Frank and I had not visited. Kiteboaring (surprise) was a major component of the trip, though the wind did not cooperate all that much. We did manage to have two really great kiting days and one other that was fair. Bird Island was our anchorage of choice for kiting. It is well protected by reefs, but the little islands between us and the wind are so low that they don’t interfere with the wind. Synchronized jumping? Needs some work. Here’s what the bottom of Hunter’s board looks like…. Clayton hadn’t kited in over two years, but it came back very quickly! Hunter found enough wind to pull a few tricks. Captain made sure she got plenty of attention from the kids and managed to find spots close enough for plenty of pets and scratches. Helping Clayton with his reading. Holding Hunter down in case it was wavy while sailing. Walking Captain was a good excuse to stroll the beaches. Our time was spent walking beaches, paddle boarding, reading and just generally relaxing. Clayton at the helm and Hunter, reading or working? There is a general attitude in our family that we don’t really like our pictures taken, so I had to sneak photos when I could. I am certain I will catch some grief for these, but, oh well. I think all of us truly relished our week together and recognize that with the kids working and us on a boat, it is pretty challenging to have all of us together. It is really difficult for me to let go of my sons, but I am thankful that they are healthy, independent, motivated and responsible. Thank goodness modern communication allows me to remain in touch. Not sure I could be gallivanting on a boat if I couldn’t stay in contact with my kids. 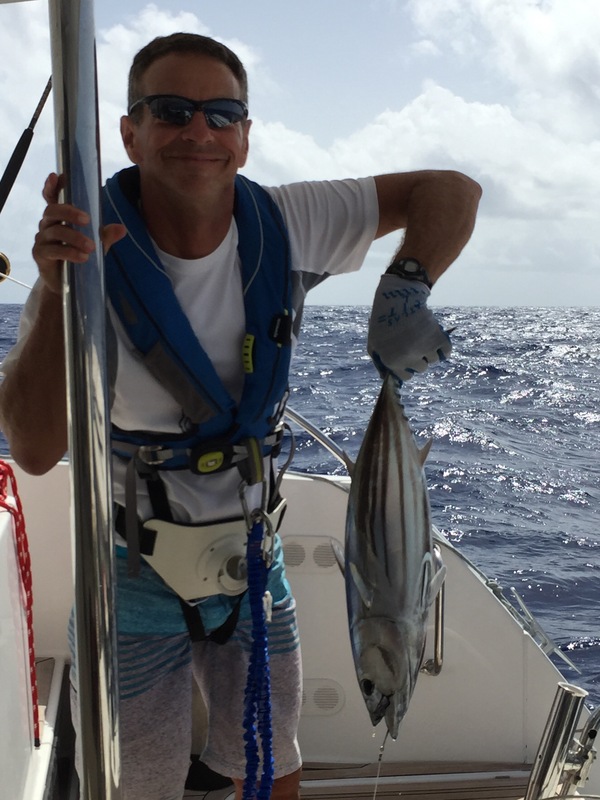 The last couple of weeks we have focused on two things: looking for kiting wind and getting down to St. Lucia where we were picking up our friend, Al. The result is that we have spent a good amount of time making southern progress but I don’t have a lot of photos to show. We managed to have a couple of great kiting days off Green Island in Antigua before the winds slacked off a bit and we began sailing south. Frank looking casual as he rides. 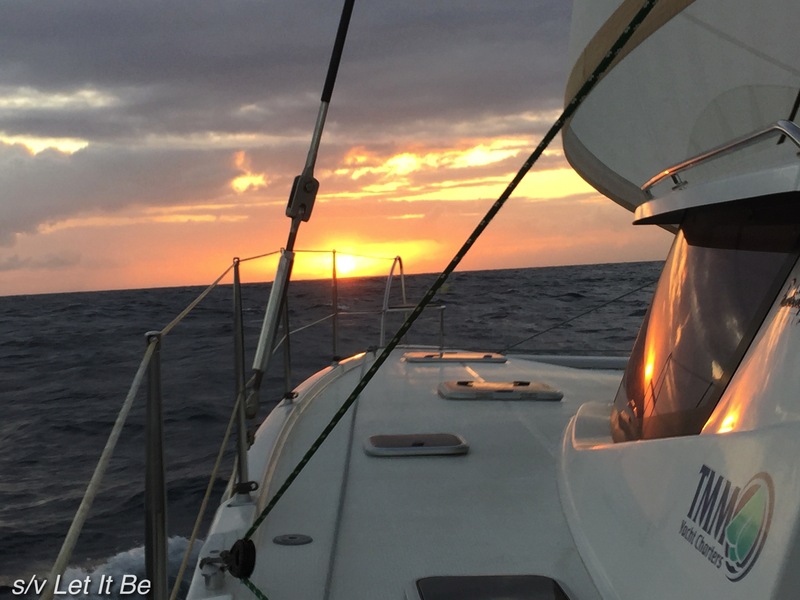 From Antigua we sailed to Guadeloupe where we stopped overnight in Deshaies. We first visited this quaint fishing village in June but this time we only stayed one night. It was fun to share it with Hunter and have him experience a bit of French culture. Next we scooted down the coast to visit Vieux Habitants, Guadeloupe where we had heard of a beautiful hike that started near a coffee plantation and ended at a waterfall. Unfortunately, between our unspecific knowledge and our poor French, we wandered most of the day and never found the hike. Still, we enjoyed the day as I had a chance to practice butchering my high school French and we had a picnic on the lawn of a pretty bed and breakfast on the edge of the river. 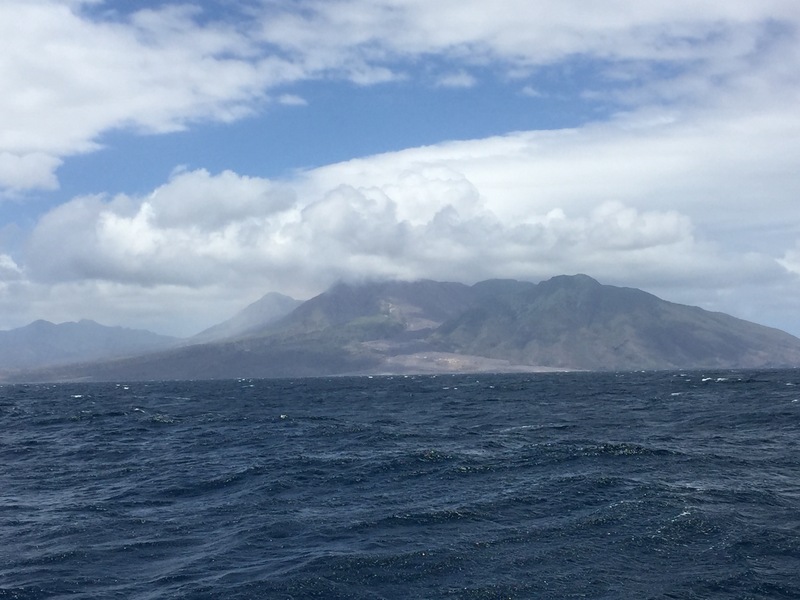 Sailing south on the western coast of Guadeloupe took us past the Pitons. I would have loved to stop, but it wasn’t part of our plan this trip. The area looks absolutely beautiful, but I must say that the aggressiveness of the ‘boat boys’ makes me much less interested in going to The Pitons. As we were sailing past the area, two boats zoomed toward us and tried to convince us to follow them to their mooring balls inside the anchorage. Neither accepted our “no” and they brought their boats way too close to LIB for my tastes! This was less than pleasant and is making me reconsider stopping on our way north. I will have to do some reading before I decide if I will stop when we work our way north again. Anyone want to offer advice or opinions and/or experiences at The Pitons? Regardless of that experience, you can see the area looks fabulous! 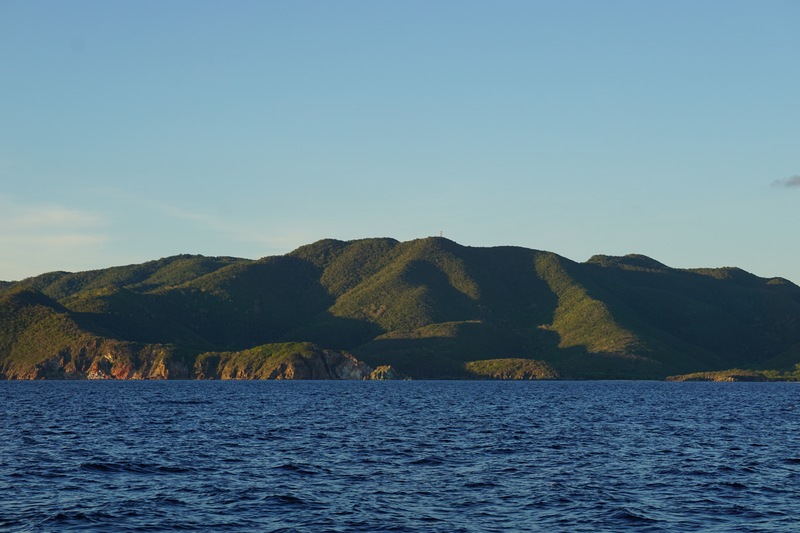 Iles des Saintes was the next stop. We had a very pleasant sail to Bourg des Saints on Terre D’en Haut. Guadeloupe is easy to see on a clear day. 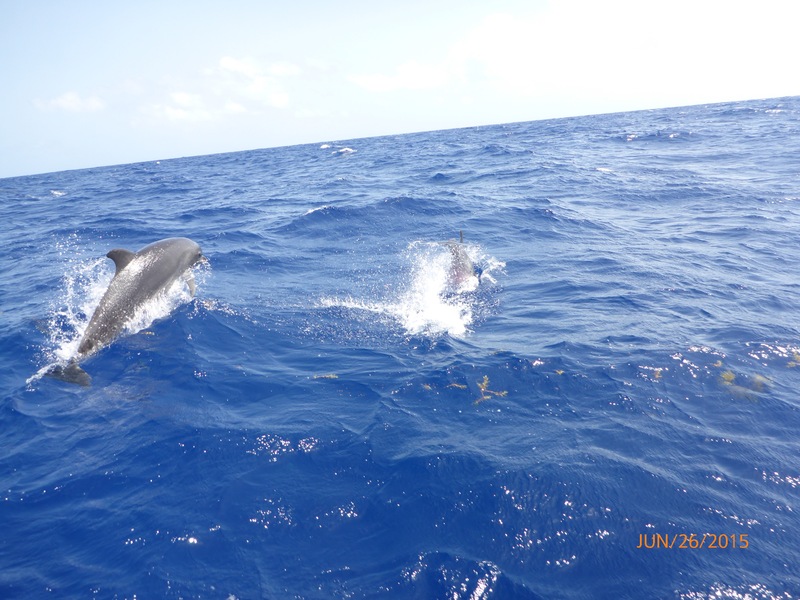 The anchorage was very pretty and on clear days Guadeloupe looked close enough to be just a long swim away…. Ok, that might be an exaggeration, but it did look close! The anchorage itself was charming and the dinghy dock one of the best we have seen in the Caribbean. Frank and Hunter tried to kite, but the wind was too light. So we spent a day tooling around Terre D’en Haut in an electric car/golf cart. A prettier picture of Bourg des Saintes. Cappy loved being free among the trees. This stand of trees right by the ocean was shady and peaceful and I could have stayed here for hours just absorbing the serenity of it. We also visited Fort Napoleon which was built in 1867. The fort is well restored and held an eclectic assortment of displays. We began our tour too close to the lunch hour as the closing bells rang not long into our visit. I especially enjoyed the models of old wooden ships and seeing the interior cross sections of what the ships held and how things were stored to balance the ship. I’ll stick with Let It Be, her modern equipment and two engines, thank you! 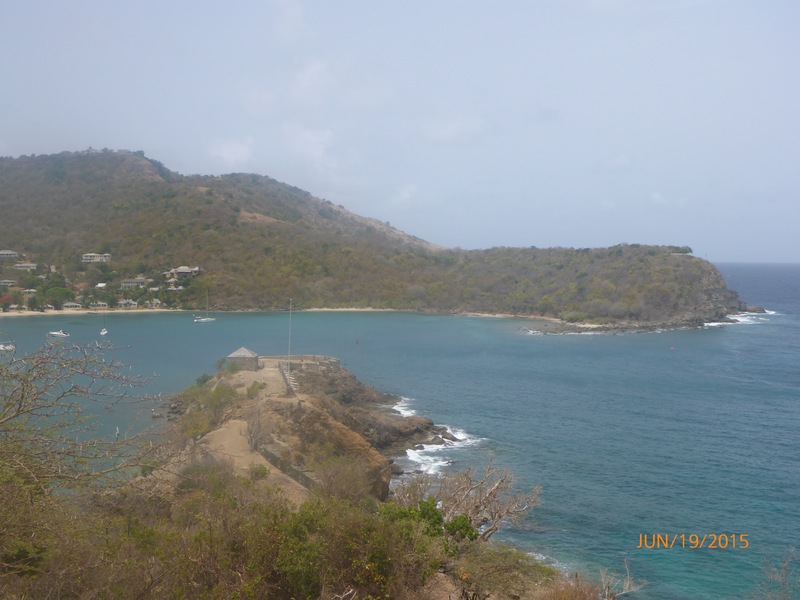 We barely touched Iles des Saintes and I really hope we will stop for a week or so on our return north, but this trip we wanted to skip on down to St. Lucia so we could accomplish a few boat projects, re-provision and prepare for some guests to arrive. Arrival in Rodney Bay, St. Lucia marked our first Windward Island as opposed to one of the Leeward Islands. Once again we experienced only a fragment of St. Lucia as we only afforded ourselves of the conveniences offered such as laundry, groceries, chandleries and restaurants. This stop was more of an opportunity to repair and prepare than explore. Hunter continued to spend a good portion of each day programming, since that is his job. Frank and I set to work cleaning, crossing off maintenance items and generally preparing LIB for visitors. 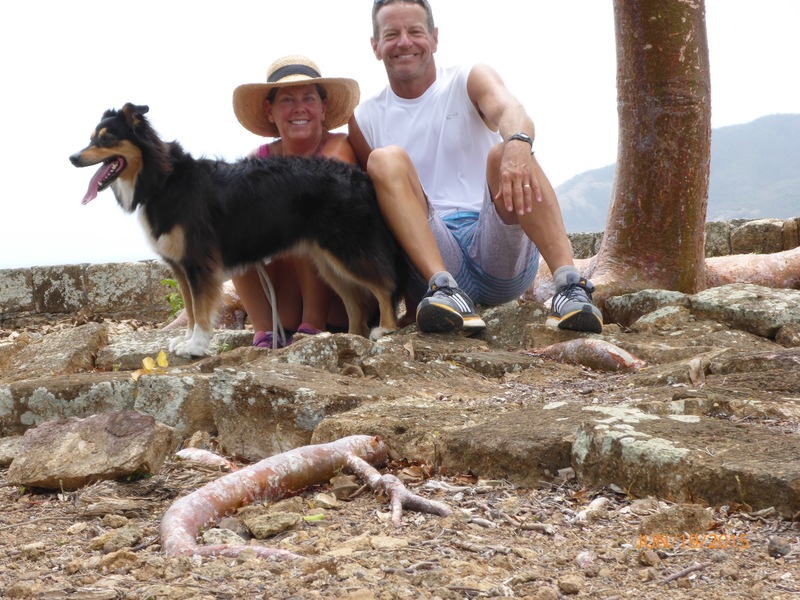 The best part of our stay in St. Lucia was meeting up with David and Amy of Starry Horizons. You may have already seen the beautiful pictures David and Amy took for us as we left?! Kind of makes us want a drone too. LIB heading south to Vieux Fort, St. Lucia. LIB on the left and Starry Horizons on the right. A rare photo of Frank, me and Hunter. David and Amy, these excellent pictures are much appreciated. I just cannot tell you how much I enjoy the company of the two people and how hard it is to know that from here forward our Helias will take us in opposite directions! SH looks pretty in the fresh morning light. I have every confidence that Amy and David will have an amazing journey on Starry Horizons and we will follow their blog, FB and videos faithfully! Happy, safe and fabulous journey you guys. Our love and prayers go with you!!! Next stop Vieux Fort where we pick up Al Young, the first of our 3 kiters to arrive. As always, thanks for reading our blog…. sorry the s-l-o-w internet has delayed my posts! 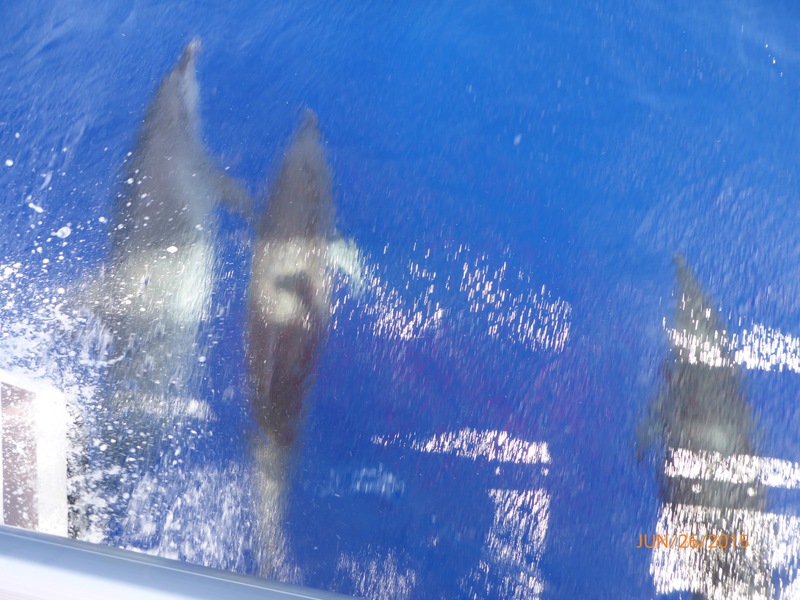 Jolly Harbour, Antigua – Take Two or is it Three? Jolly Harbour feels like the treasure at the end of a rainbow. Jolly Harbour has been a very welcome anchorage after both of our passages from St. Martin. This time I was ready to return to Jolly because the surge in Nelson’s Dockyard made our lines squeak at night which made sleep a little difficult. Even though I really like English Harbour, I am such a light sleeper that the squeak kept me awake so I was ready for the quiet of Jolly Harbour. 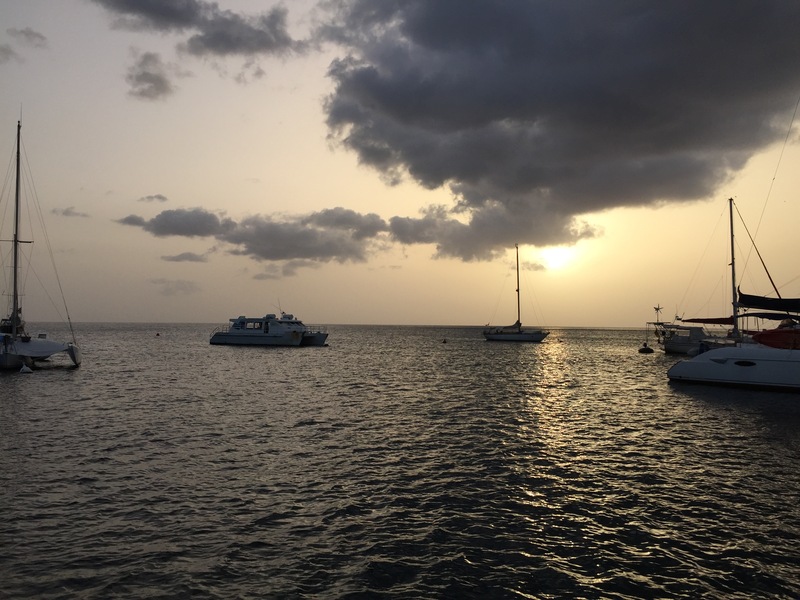 Last June we visited Jolly Harbour, so we knew what to expect this time and we were not disappointed. The folks in Jolly Harbour Marina are very nice and always have a smile. Jenn was in the marina office again this visit and her warm welcome was appreciated. One really nice change in JH is the upgrade to their internet signal. Jenn told us that in the past the marina had complaints about the wifi, so they upgraded the system. Since then she said they have not had any complaints. We were on a mooring ball and had excellent wifi on LIB. Thanks for the upgrade Jolly Harbour!! As you can see from the picture above, there are a lot of private homes with boat docks along the edges of JH which offers a different view and feeling from many anchorages. These quiet fingers are perfect for paddle boarding. Last year we wrote about our visit to Sha Sade where Frank had his hair cut. This year I visited Shamone who gave me a manicure/ pedicure and even dyed my eyebrows for me. It was like a regular spa day! Shamone and Sadie’s store front. The salon is in the building right next to the dinghy dock so the location is perfect for boaters. I will certainly go back the next time I’m in Jolly Harbour. Near the mooring balls their is a neighborhood with an open field and quiet streets which makes a perfect place for us to throw the frisbee for Captain. She apparently thinks we should have gone there more often as she decided she would sleep in the dinghy between visits! She has only done this in Jolly Harbour, so I’m guessing this is one of her favorite anchorages. Yes, that black ball of fluff is Cap waiting for another trip to shore! This time we left Jolly Harbour to head to Shell Beach where we picked up our older son, Hunter. What a great reason to head out. 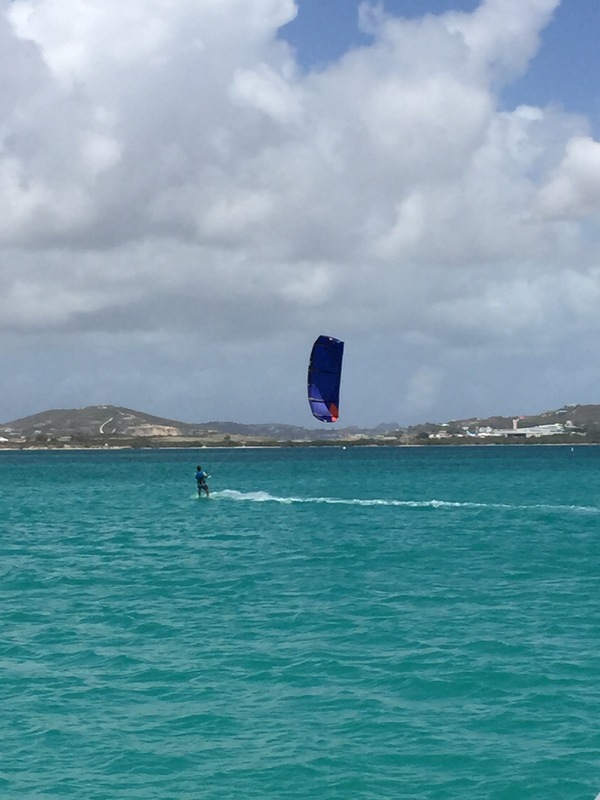 The focus of Hunter’s visit is kiteboarding. Frank has been anxiously waiting for this opportunity to kite with Hunter right off of LIB. 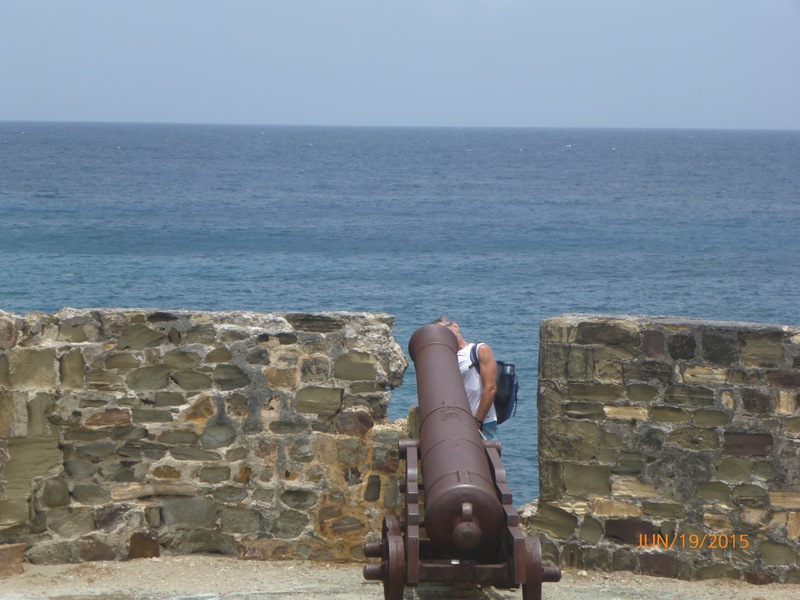 Last June when we visited Antigua we loved it. We felt like we barely saw the island and it has such a variety of anchorages that we wanted to come back and spend more time here. The view from our boat as 2016 arrived. Specifically we wanted to spend New Year’s Eve in English Harbour where we would be surrounded by the history of Nelson’s Dockyard as 2015 became history and we ushered in 2016. Nelson’s Dockyard, a National Park, is the only continually working Georgian Shipyard in the world. The first recorded ship to enter English Harbour was “Dover Castle” in 1671 and by 1707, English navel ships used the harbor regularly. The first dockyard, St. Helena, was constructed around 1728. Building of what currently exists and is Nelson’s Dockyard began around 1740 by enslaved labor from nearby plantations. Approaching Nelson’s from the inland street. Photobomb by Captain. The dockyard was named after Admiral Horatio Nelson who lived there from 1784-1787. According to our tour guide “Q,” Nelson was not well liked and actually lived on his boat in the harbor rather than in the dockyard as he was afraid he would be killed by local workers. The buildings have been restored and are open for business today. Often the buildings house businesses that are similar to the original, just modernized. This canal was used to bring sails to the loft for repair. Quaint streets lead to the docks. Landscaping outside what was once the hospital and is now a hotel. Today Customs and Immigration is in the buildings to the left. The building on the right in the above picture once housed officers on the second floor on the right side. The left side of the second floor held dead bodies until they were buried. It wasn’t all history and fireworks in English Harbour. We also rode bikes up to Shirley Heights, the former military signal station where soldiers would use signal flags to communicate information about approaching ships to forts as far away as St. John. 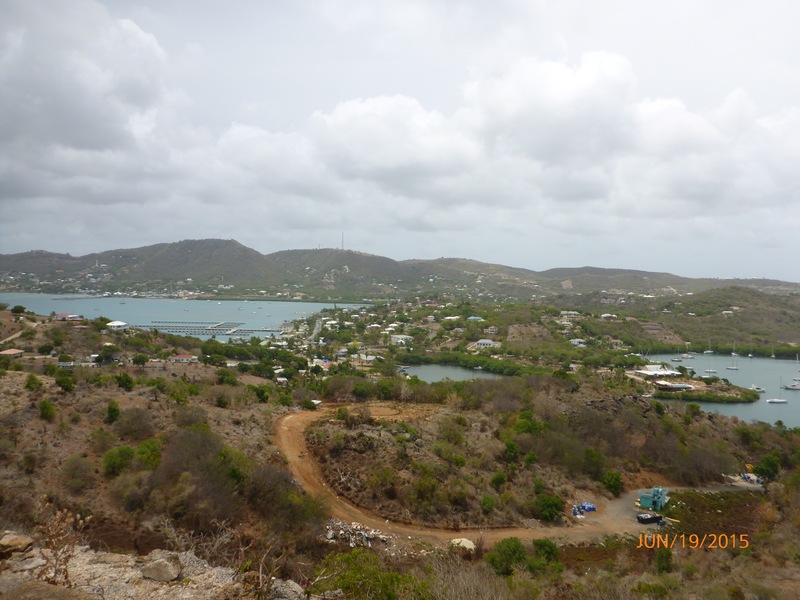 It was a steep bike ride to the highest point on this part of Antigua. Shirley Heights, a bird’s eye view of English and Falmouth Harbours. We also walked to Falmouth Harbour for a visit to West Marine and a bit of exercise. Beautiful views popped out along the road way. Along the main road in Falmouth. These were the salt and pepper shakers at our breakfast spot. I guess even the condiments find love in Falmouth Harbour. In addition to all this history and sight seeing, we met and talked to a lot of cruisers. It was great getting to know so many new people. A special thanks to Roger and Lynne aboard Schatzi who gave us excellent information concerning pet entry into countries south of here. The final and most unique aspect to our English Harbour visit was the invitation to join a family for dinner on their yacht. This family was incredibly generous and shared their table and their religious traditions with us. It was an evening we will remember and cherish forever. It’s Not All Rainbows…Peal Back the Glasses. Jolly Harbour with it’s flat water looked like heaven! Admittedly, we are beyond blessed to have the opportunity to live on LIB and have these adventures. I know Facebook and blogs tend to make cruising look like an idyllic, lazy lifestyle. And it certainly can be. But let’s be realistic for just a minute; peal back the rose colored lens and share with you our trip from St. Martin to Antigua. December is the time for “Christmas winds” in the Caribbean which means the wind is strong! Add to this the fact that Antigua is south east of St. Martin which meant going there would be sailing into the wind because the wind usually comes from the east. We were facing a pretty miserable trip. 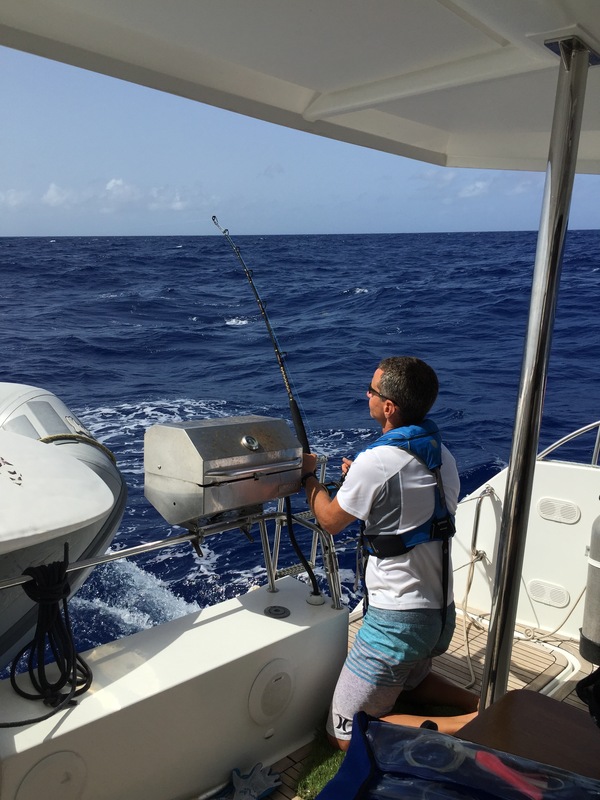 So when we saw a slight north predicted in the wind on December 27th, we decided to grab it and hope we could sail fairly close to our rhumb line to Antigua. The good news is that there actually was a bit of north in the wind. The bad news is that the winds, which were predicted to be around 20 knots, were consistently above 25 knots and usually were around 29 knots. The highest wind speed we saw was 41 knots during one of the several squalls we faced. 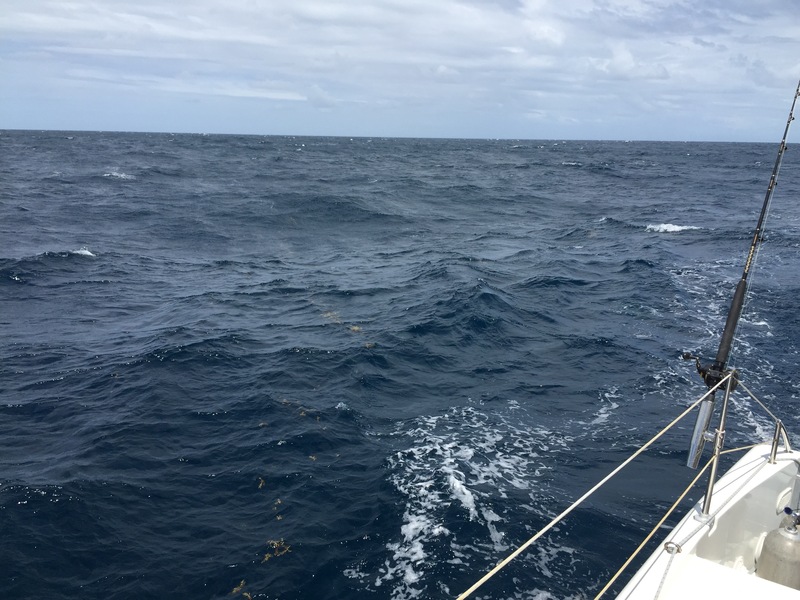 Next, combine the delightful winds and squalls with waves that were 8-10 feet until we were an hour from Antigua. As if this weren’t enough, the passage is about 88 miles which means we sailed overnight. The final piece de resistance is seasickness. Yep, I prepared by taking Meclizine the night before but I didn’t take it during the trip because I wanted to be awake and able to help. Bad planning on my part. I would have been more help working sleepily than I was because I was too ill to do much more than a one or two hour shift. So, that is the bad part. There were actually some good things too. ~The wind had enough north in it that we were able to sail pretty directly to our destination without tacking. ~We were cautious with our sail area. 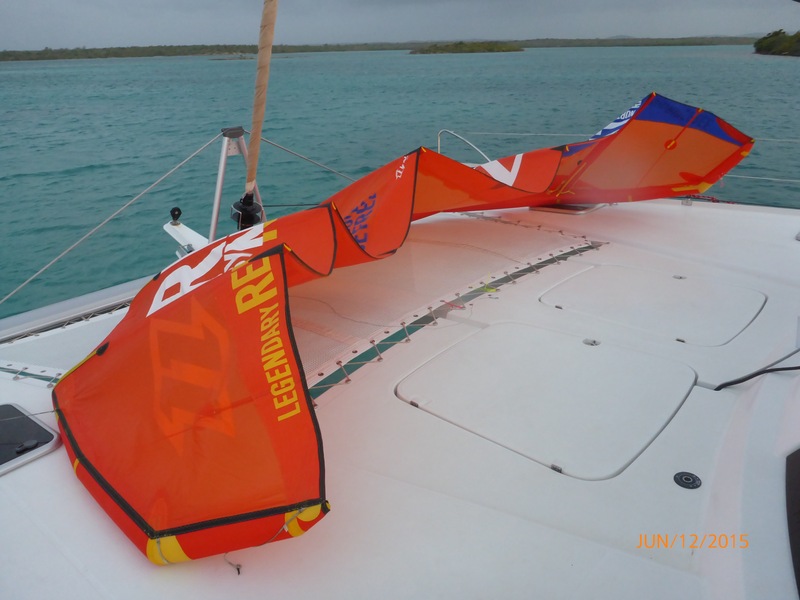 We had double reefed the main and our jib was also shorted. So even though the motion was rough, between our reduced sail area and heading up into the wind to reduce forces, we were safe. 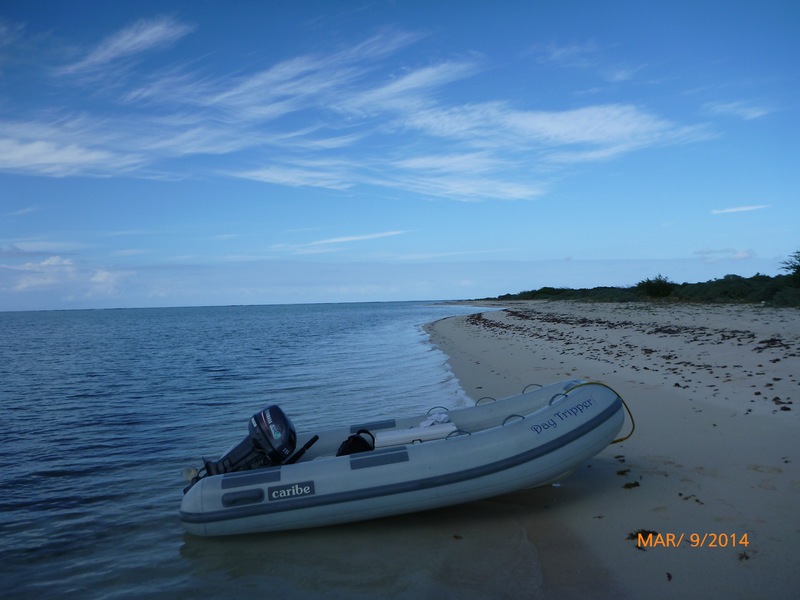 ~We arrived pretty quickly – we were along the Antigua shore after about 17 hours. 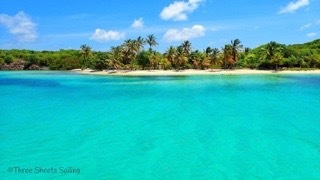 ~We love Jolly Harbour and it is a beautifully calm anchorage! All in all, the trip to Antigua was not fun for me, though Frank fared much better! Still, we will be around Antigua for about a month and our next several sails should be with the wind instead of against it. So, next time you are looking at a blog or FB page and everyone else seems to be having these amazing, beautiful, idyllic, exciting lives…. remember, you are only seeing the rosy bits. Anyone else care to share a less than perfect sail story? Front Porches, Rocking Chairs, Lemonade…. Not For These Retirees! Gliding past St. John, USVI. While we will definitely watch the world go by, it will be from the deck of our boat and the view will change often and not only because of the seasons. For the next few weeks our “porch” will be remain in one place and will be topsy turvy as we begin and complete refitting tasks we deem “necessary” for life on board. Our plan, which changes often, is to stay in Fajardo, PR until we finish our projects or until November 30th, whichever comes first. 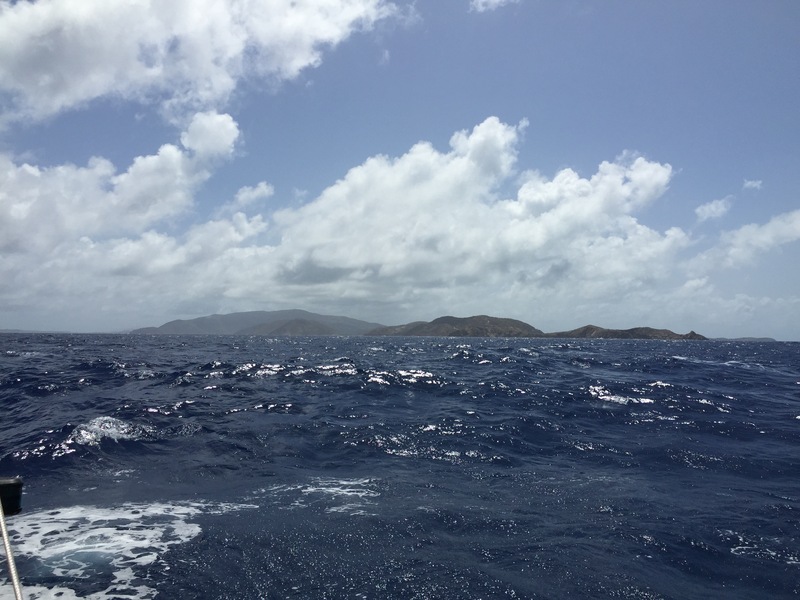 Then we will sail back to BVIs to pick up a few items TMM is holding for us; but we will move on quickly. I would like to spend a bit of time in the USVIs since we really have not explored them. The islands look fabulous and it’s always nice to be in the US. Plus, I have yet to try Pizza PI pizza in Christmas cove and that is surely on my “to do, to see, to eat” list. We plan on sailing back to Antigua in mid-December where we really want to meet up with our friends Amy and David on Starry Horizons. Amy and David, Captains of Starry Horizons. We first met Amy and David way back in February 2014 in Ft. Worth, TX when Amy was running the Cow Town Marathon. At that time, Starry Horizons was just being built in France. 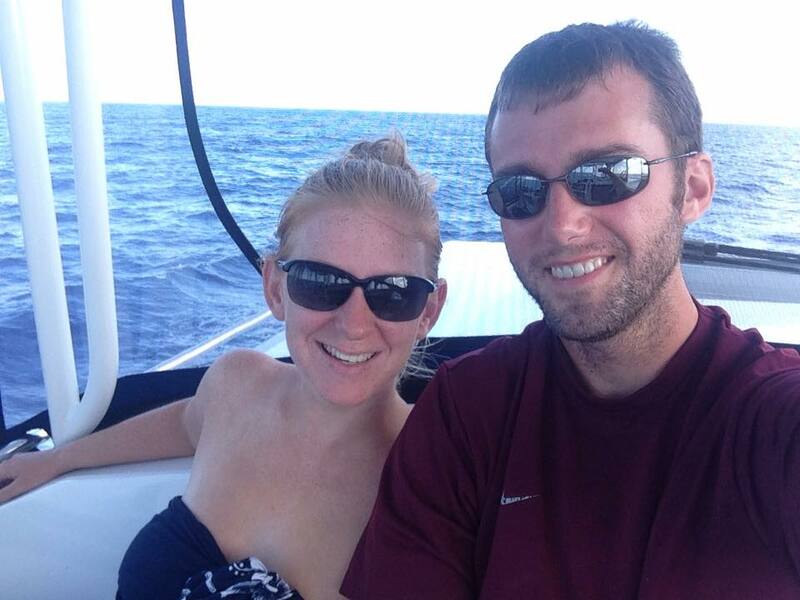 Since taking delivery of SH, Amy and David have sailed more than 8,500 miles and have accumulated much more experience than we have. You can read about Amy and David’s adventures in their blog, Out Chasing Stars. Because we have the same model boat, it is really fun to compare notes with Starry Horizons. Plus they are lots of fun and we are excited to sail and explore some anchorages together. The only other set plan is to be in the Grenadines in February. Frank has planned to meet some kiteboarding buddies there and LIB will be the home base as we move from one great kite beach to the next. This will be a mostly “guys” week, but they are letting me hang around. The front deck of LIB is a perfect kite drying spot. I’ll get a chance to practice my kite boarding, but I have a feeling I will also play rescue support via Day Tripper. 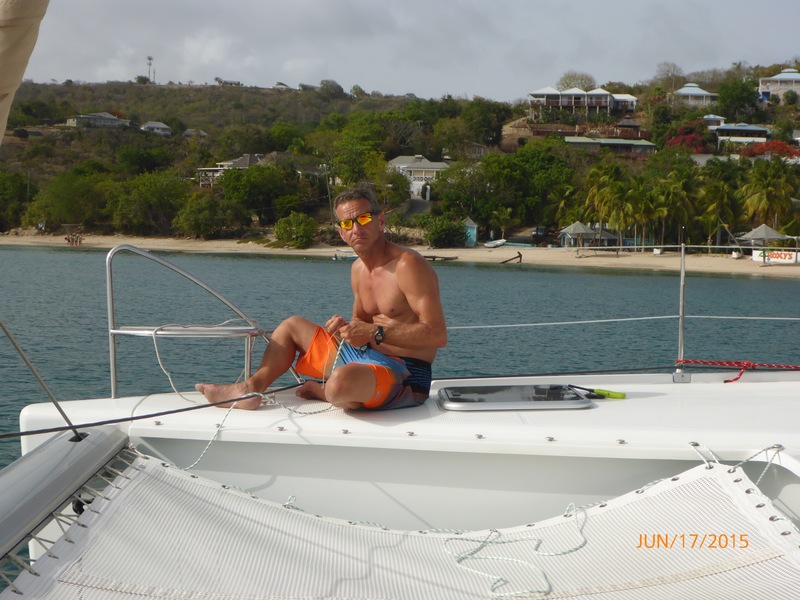 The two years we had LIB in charter, a few girlfriends and I enjoyed an annual sailing week in the BVI during the Fall. It’s always fun and lots of laughs wit this group. Since LIB is undergoing so many changes right now, the girls trip could not be made this year. BUT the plan is to redefine our trip by expanding our locations. 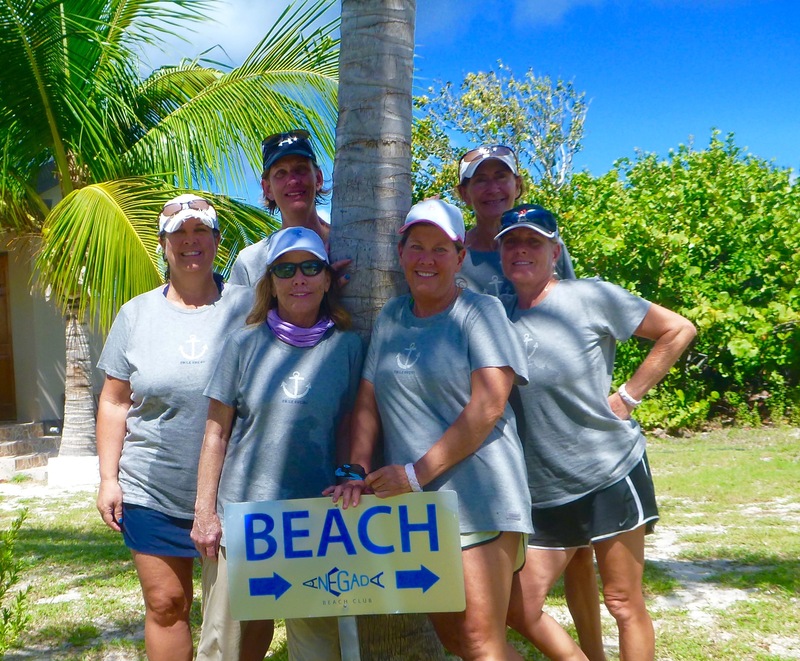 This all girl crew will join us somewhere this spring… I’m thinking the Tobago Cays and other parts of the Grenadines would be perfect! Photo credit to Three Sheets Sailing! Our travel is now dictated by wind and weather which makes these plans less than firm, but it’s nice to have a vague idea of where we are headed. 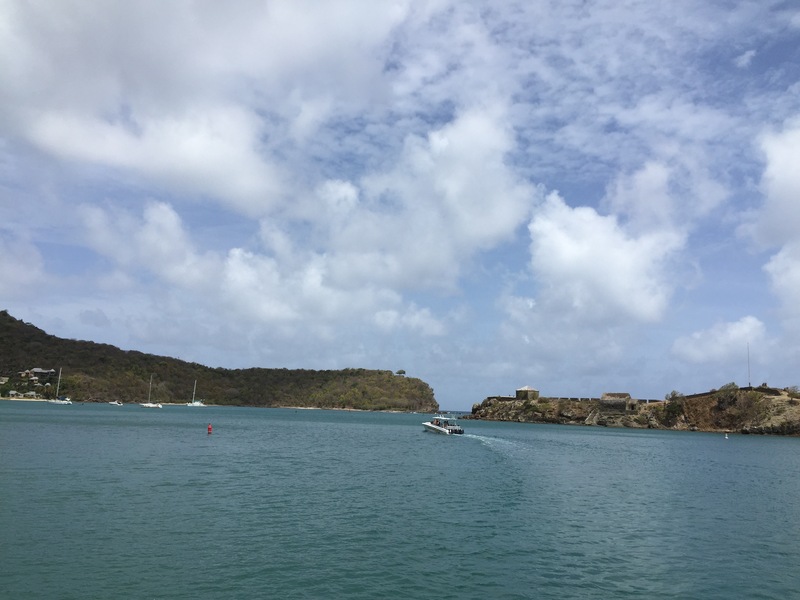 After spending about a week in the less developed northern parts of Antigua where the kiteboarding was excellent and restaurants non-existent, we sailed to the southern part of Antigua and entered English Harbour. One cannot visit English Harbour without becoming cognizant of it’s importance in the history of Antigua and the surrounding area. The first thing you observe when arriving at the port is Fort Berkeley, which still stands on the western entrance to English Harbour. Looking out toward the entrance to English Harbour. The construction of Fort Berkeley began in 1704 and after several additions was completed in 1745. It was a pivotal sentry against attack since the British Navy housed it’s fleet at Nelson’s Dockyard which was landlocked within the harbor. All told, Ft. Berkeley had 29 large cannons. 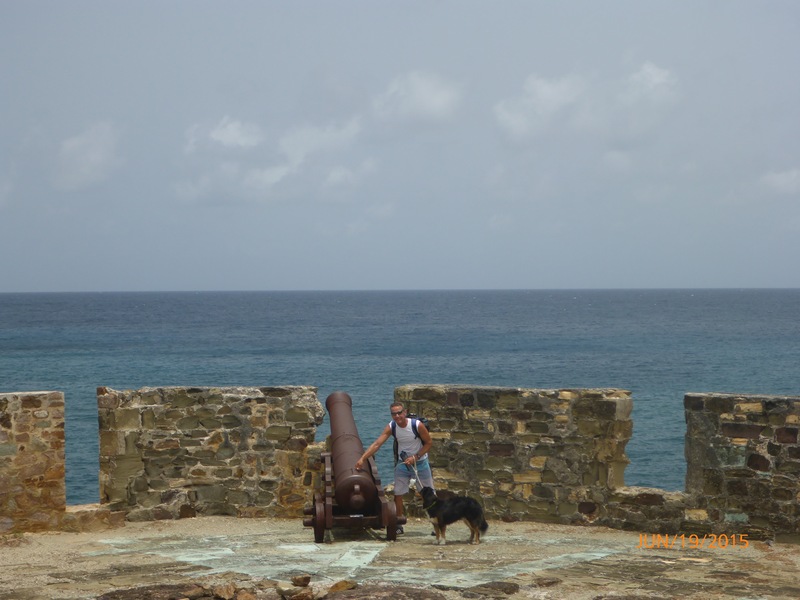 Antigua was considered such an important location that a total of 40 forts were built on it. A commanding view and position to protect the harbor. We took time to walk to Ft. Berkeley and follow the trail to some additional, smaller outposts that led all the way to Falmouth Harbour. This sounds like a long walk, and it was hilly, arid and rocky, but the distance is actually not great. You can see in the picture below that there is only a small section of land that separates English and Falmouth Harbours. English Harbour to the right and Falmouth to the left. While we enjoyed the views and exercise, Captain kept a close watch for her new nemesis, the goat! 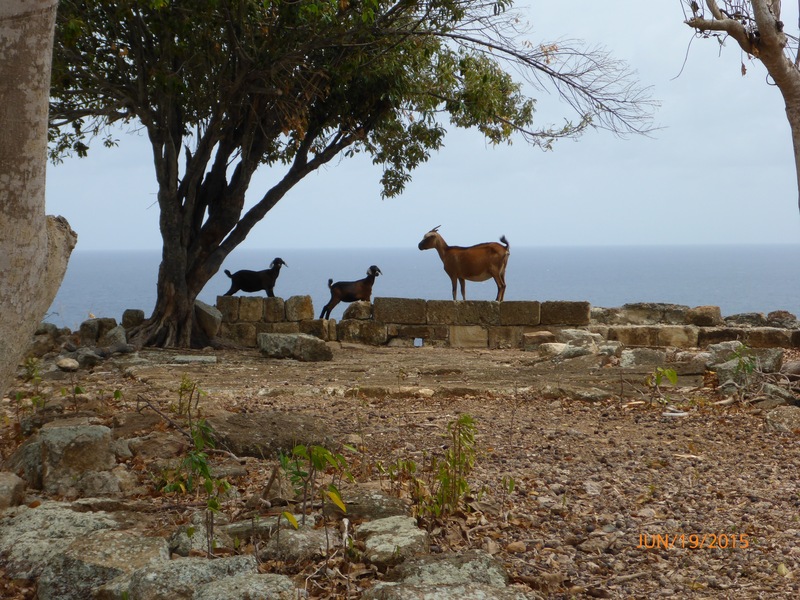 Goats are the only remaining sentries at the forts. Captain has decided that it is very important to chase any and all goats far from us, so we have to keep her on leash if we know they are around. Unfortunately on this walk, she spotted a goat while off lead….the chase ensued and within seconds Captain and said goat were careening down the side of the hills. We saw Captain still running full out about 200 yards below us and we were not sure what to do. Fortunately her sense of direction is excellent and within a few minutes she came trotting right back to where she had left the trail. Her tail was high and she wore a huge grin, absolutely confident that she had just saved us from a fearsome goat! You will note Captain is back on leash, but she is vigilantly watching those goats! I wish it was possible to share the aura and history of Nelson’s Dockyard. The buildings have been beautifully restored and are now used to house restaurants, shops, hotels, art galleries and more. As we walked the cobblestone streets the sense of past spirits was present. Of course, I imagined dashing navel officers and ladies in heavy dresses while Frank’s imagination leaned more toward drunken brawls and pirates! We would both like to return to English Harbour and learn more about the history as we only touched the surface! Frank lighting the fuse….. Ummm, this looks like a cartoon about to go wrong! Knots are important in the life of a sailor. The calm water and pleasant breeze over the hills made English Harbour the perfect place for us to reline the trampoline on Let It Be. Glad we did as the old line looked worse than expected when we replaced it.